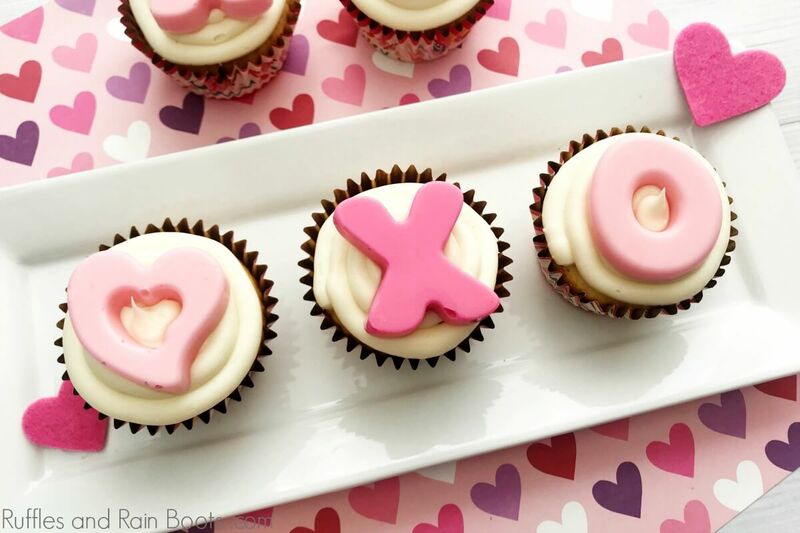 Make this hugs and kisses cupcake recipe and bring the smiles on Valentine’s Day. Perfect for a class party or a get-together with friends, these are sure to please! 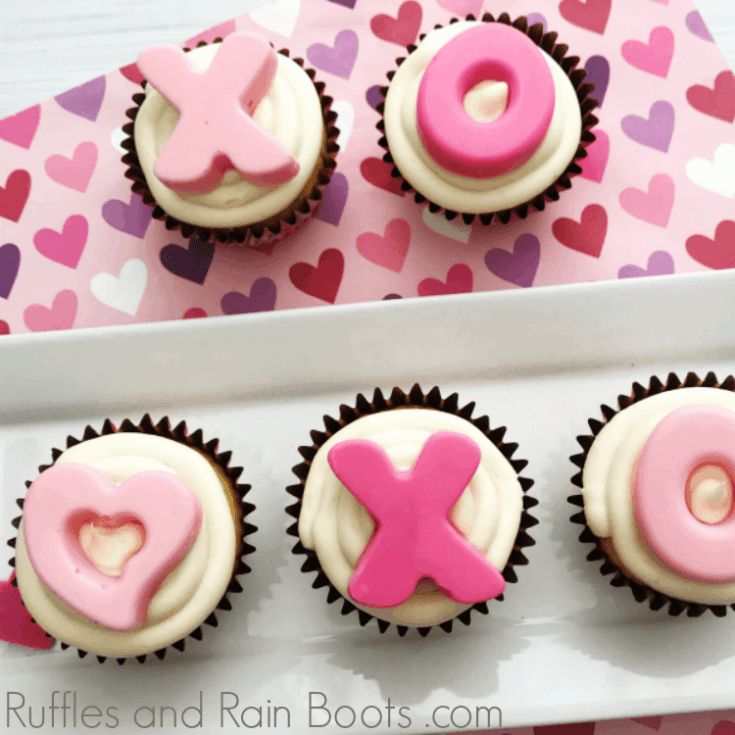 Here at Ruffles and Rain Boots, we love sharing fun Valentine’s Day cupcake recipes with you. 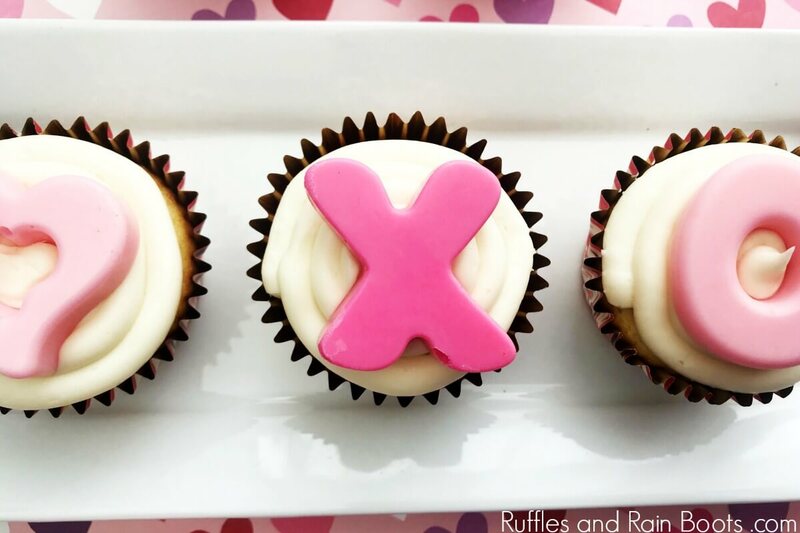 You might have seen our other X’s and O’s style Valentine’s Day cupcake made with fondant. If you just squinched up your face at the thought of fondant, I hear ya – fondant is a dessert diving line. Some love it, others can take it, and well, there’s everyone else who lifts it off and won’t touch it. Should you be the face-squinching type, this hugs and kisses cupcake recipe is for you! It’s fun and it’s topped with candy. After you pour in the candy, run a toothpick inside the letter molds. It will help reduce air bubbles. Use the letter molds – I tried using cookie cutters – big fail! 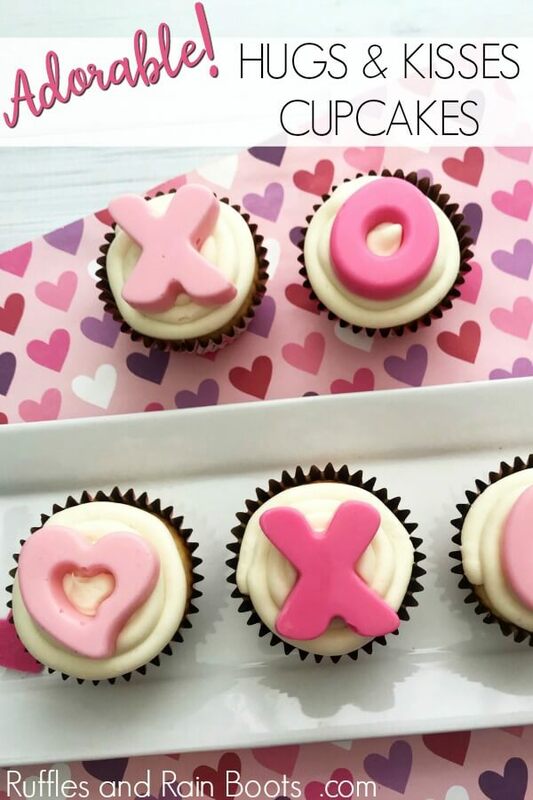 If you’re creating a Valentine’s Day cupcake playlist on YouTube, here is our video for these adorable Hugs and Kisses cupcakes. 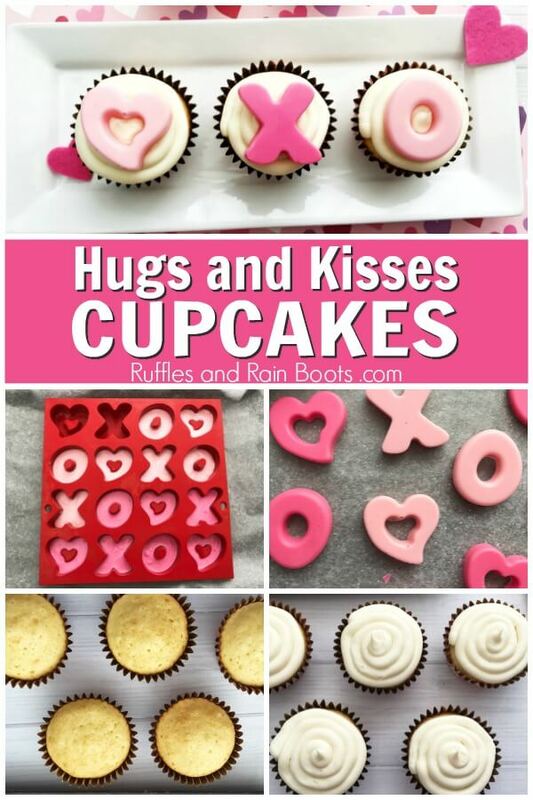 These adorable and easy hugs and kisses cupcakes for Valentine's Day are perfect for the sweetest holiday. Bake 12 cupcakes (click here for our easy vanilla cupcake recipe - it's perfect for this). You can double the batch, if needed. Allow to cool completely. In a microwave safe bowl, melt the light pink candies per package instructions. Let it cool slightly and transfer to a disposable piping bag (or sandwich bag). Pipe into the mold. Repeat the process for the bright pink candy melts. Set aside to harden (can be placed in the refrigerator for 10 minutes). Next, combine all frosting ingredients into a stand mixer or large bowl and mix until smooth. Transfer to a piping bag with a round tip (I used a #10). Once the candy toppings have set, gently remove each from the mold. 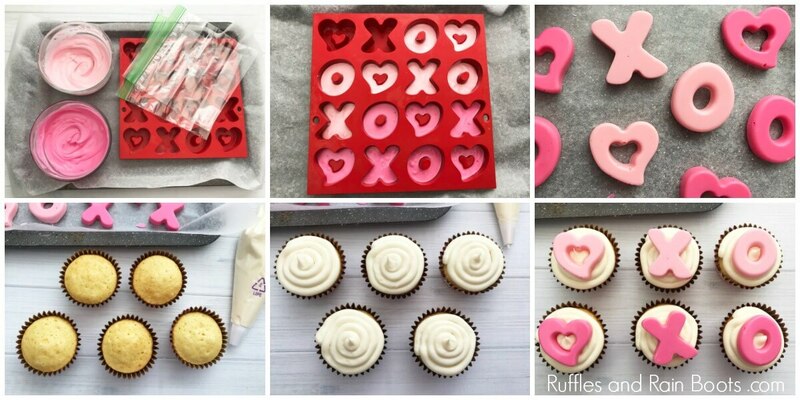 Now it's time to assemble your cute hugs and kisses cupcakes! Frost each cupcake and place a candy on top. All nutrition information is estimated and doesn't include the cupcakes. Please calculate your exact brands and ingredients when accuracy is desired. 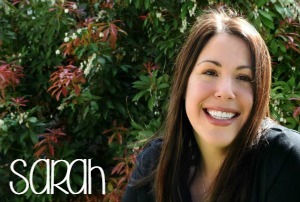 Your shares are how this site grows and I am sincerely grateful! Share this to Facebook or save to your favorite Valentine’s Day board on Pinterest.